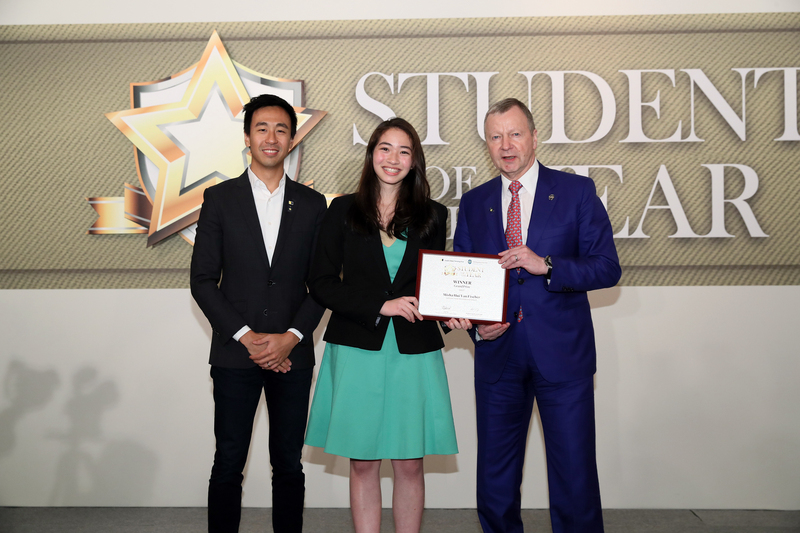 HONG KONG (March 20, 2018) –– The South China Morning Post celebrated the 37th annual Student of the Year Awards on Saturday (March 17), recognising nineteen exemplary Hong Kong secondary school students. The awards presentation ceremony, which took place in the Grand Ballroom at the Kowloon Shangri-La Hotel, featured Guest of Honour the Hon. Matthew Cheung Kin-chung, HKSAR Chief Secretary. Solely sponsored by The Hong Kong Jockey Club and with support from the Education Bureau, the Student of the Year Awards spotlight students’ outstanding talents and accomplishments, recognising achievements in academic subjects, linguistics, sports, performing and visual arts, science and mathematics, and community service contributions. Last year, two new awards, “Best Devotion to School” and “Best Improvement,” were debuted, totalling nine award categories. The winning students underwent several rounds of rigorous group discussions, auditions, interviews, and other forms of assessment adjudicated by a number of subject experts. Over 675 students were nominated from 152 schools in Hong Kong to participate in the tight competition for the top Student of the Year Awards honours. The awards received support from the judging panels as well as the Advisory Board, which consisted of the following Hong Kong leaders: Mr. Gary Liu, SCMP Chief Executive Officer; Mr. Winfried Engelbrecht-Bresges, Chief Executive Officer of The Hong Kong Jockey Club; the Hon. Bernard Charnwut Chan, Hong Kong Deputy of the National People’s Congress and Convenor of the Executive Council of the HKSAR; Dr. Allan Zeman, Chairman of Lan Kwai Fong Group; and Mr. Lau Ming-wai, Chairman of the Commission on Youth. The Student of the Year Awards 2017 ceremony was successfully held on March 17. Winners pose for a group photo at the Awards Presentation Ceremony. Mr. Winfried Engelbrecht-Bresges (left) and Mr. Gary Liu presents the Grand Prize awards to Misha Fischer.